ARP Instruments, Inc. was an American manufacturer of electronic musical instruments, founded by Alan Robert Pearlman[note 1] in 1969. Best known for its line of synthesizers that emerged in the early 1970s, ARP closed its doors in 1981 due to financial difficulties. The company earned a reputation for producing excellent sounding, innovative instruments and was granted several patents for the technology it developed. "The electronic instrument's value is chiefly as a novelty. With greater attention on the part of the engineer to the needs of the musician, the day may not be too remote when the electronic instrument may take its place ... as a versatile, powerful, and expressive instrument." Following 21 years of experience in electronic engineering and entrepreneurship, Alan Pearlman founded ARP Instruments in 1969 with US$100,000 of personal funds and a matching amount from investors, with fellow engineering graduate David Friend on board from the beginning as the co-founder of the company. Throughout the 1970s, ARP was the main competitor to Moog Music and eventually surpassed Moog to become the world's leading manufacturer of electronic musical instruments. There were two main camps among synthesizer musicians — the Minimoog players and the ARP Odyssey/ARP 2600 players — with most proponents dedicated to their choice, although some players decided to pick and choose between the two for specific effect, as well as many who dabbled with products produced by other manufacturers. Notably, the ARP 2500 was featured in the hit movie Close Encounters of the Third Kind; ARP's Vice President of Engineering, Phillip Dodds, was sent to install the unit on the movie set and was subsequently cast as Jean Claude, the musician who played the now famous 5-note sequence on the huge synthesizer in an attempt to communicate with the alien mothership. The demise of ARP Instruments was significantly influenced by the ill-fated decision to invest a significant amount of capital in the development of the ARP Avatar, a synthesizer module virtually identical to the ARP Odyssey sans keyboard and intended to be played by a solid body electric guitar via a specially-mounted hexaphonic guitar pickup whose signals were then processed through discrete pitch-to-voltage converters. Although an excellent, groundbreaking instrument by all accounts, the Avatar failed to sell well. 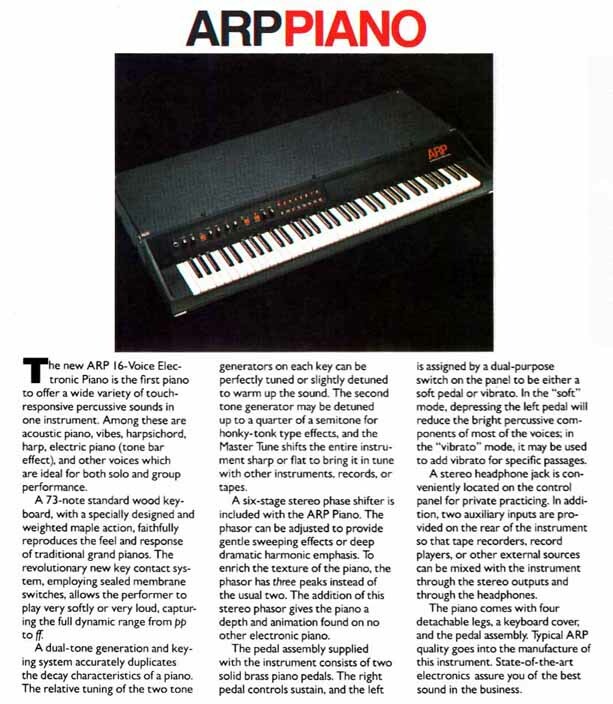 ARP Instruments was never able to recoup the research and development costs associated with the Avatar project and, after several more attempts to produce successful instruments such as the ARP Quadra, ARP 16-Voice & 4-Voice Pianos, and the ARP Solus, the company finally declared bankruptcy in 1981. During the liquidation process, the company's assets and the rights to the manufacture of the 4-Voice Piano and also the prototype ARP Chroma - the company's most sophisticated instrument design to date - were sold to CBS Musical Instruments for the total sum of $350,000. The project was completed at CBS R&D, and the renamed Rhodes Chroma was produced from 1982 to late 1983. The instrument is notable for a very flexible voice architecture; 16-note polyphony; a high-quality weighted, wooden keyboard action; pioneering use of a single slider parameter editing system (subsequently implemented on the Yamaha DX7); and the inclusion of a proprietary digital interface system that predated MIDI. 1970 - ARP 2500 (large and complex analog modular synthesizer, patched with a switch matrix, noted for its reliable tuning compared to competitors Moog and Buchla. Almost identical to the ARP 2002, except that the upper switch matrix had 20 buses instead of 10. ); the ARP 2500 is the synthesizer heard on 'Won't Get Fooled Again' by The Who. Tony Banks of Genesis played an ARP 2600, an ARP Pro Soloist (on the album Selling England by the Pound) and later an ARP Quadra. The BBC Radiophonic Workshop's Peter Howell used an ARP ODYSSEY II for the lead sound to update the Doctor Who TV theme in the early 1980s. Todd Tamanend Clark played an ARP 2600, ARP Odyssey, ARP Avatar, and ARP Quadra. Vince Clarke plays an ARP 2500, two ARP 2600 and two ARP Sequencer. Billy Currie of Ultravox played an ARP Odyssey on many of their songs, and helped to define their sound in the Midge Ure led incarnation. Paul Davis played an ARP Odyssey, ARP 2500, ARP 2600 and ARP Quadra..
Devo used an ARP Odyssey on their Freedom of Choice tour. Vocalist/keyboardist, Mark Mothersbaugh reported that the instrument broke down in such a way that it created an entirely new sound which would have been otherwise impossible to achieve. The "broken down" Odyssey is apparently featured in the Duty Now for the Future song, "Pink Pussycat". Doru Apreotesei used an ARP Axxe in his work with the Romanian jazz-rock-pop fusion band Post Scriptum. He can be seen playing the ARP Axxe live in a recording from the 1981 Sibiu Jazz Festival. Michael Duwe played an ARP Odyssey on his album Mickie D's Unicorn. Herbie Hancock played an ARP Odyssey, an ARP Soloist and ARP 2600 and an ARP String Ensemble in the album Thrust. Elton John played an ARP String Ensemble in the album Captain Fantastic and the Brown Dirt Cowboy'Also played ARP on Funeral For a Friend on the album Yellow Brick Road'. Dave Lawson played an ARP Odyssey Mk 1 on the Greenslade albums: Bedside Manners Are Extra, Spyglass Guest, Time And Tide and the various Greenslade Live releases. Gordon Langford produced the album The Amazing Music of the Electronic Arp Synthesizer in 1974. Former Deep Purple keyboardist, the late Jon Lord, played an ARP Odyssey. Marilyn Manson is listed as using an "ARP synthesizer" in the album Mechanical Animals. Scott McCaughey plays an ARP Odyssey on several songs on R.E.M. 's New Adventures In Hi-Fi. Christine McVie of Fleetwood Mac played an ARP String Ensemble on the album Heroes Are Hard To Find and on Rumours, notably her composition "Don't Stop". Mircea Dragan used an ARP Odyssey MK III with his work with the Romanian funk, soul and disco band Romanticii (The Romantics). Anthony Phillips played an ARP String Ensemble and ARP Pro Soloist on his 1977 album The Geese and the Ghost. The album's title derived from Phillips' nicknames for two sounds he produced on the Pro Soloist, both of which feature on the title track. Todd Terje uses an ARP Odyssey, an ARP Sequencer and an ARP 2600 in most of his productions. He used the 2600 exclusively for his It's The Arps EP from 2012, which contains his biggest hit to date, Inspector Norse. Stevie Wonder used a custom Braille 2600. Joe Zawinul of Weather Report used two ARP 2600s and later an ARP Quadra and an ARP Chroma. Zodiac (band) used ARP Odyssey and ARP Omni. "'Alan Richard Pearlman': 4 results". Google Books Search. ^ "'Alan Robert Pearlman': 9 results". Google Books Search. ^ "The resurrection of ARP by Korg". arpsynth.com. May 2014. Retrieved 28 February 2015. ^ a b "Korg Announces the development of the ARP Odyssey synthesizer". Korg. Retrieved 17 February 2014. ^ "ARP 2500". Sound On Sound. August 1996. Archived from the original on 6 February 2015. ^ "Arturia - Overview". arturia.com. Retrieved 11 April 2018. ^ "Ohm Force". www.ohmforce.com. Retrieved 11 April 2018. ^ "Instrument Overview - GFORCE SOFTWARE". www.gforcesoftware.com. Retrieved 11 April 2018. ^ "ARP Axxe & Little Brother (Retro)". Sound On Sound. May 1996. Archived from the original on 6 June 2015. ^ "ARP Sequencer". Music Trades. Music Trades Corporation. 124 (May 1976): 31. 1976. 3 FOR THE SHOW 1. ARP Sequencer The long-awaited ARP live performance sequencer is here. Loaded with elegant features, the sequencer interfaces with the ARP Axxe, Odyssey and 2600 synthesizers. ... MUSIC TRADES. MAY. 1976 31. ^ ARP PIANO (brochure), ARP Instruments, Inc., 1979 . (courtesy of Kevin Lightner) seen on: "ARP 16-Voice Electric Piano". Synthmuseum.com. ^ a b c d e f g "CLOSE ENCOUNTERS OF THE ARP KIND". soundonsound.com. August 1996. Retrieved 3 August 2010. ^ "Korg Oasys: On Tour with Tony Banks and Genesis". dv247.com. Retrieved 3 August 2010. ^ a b "David Bowie - Low (CD, Album)". Discogs. Archived from the original on 8 August 2010. Retrieved 3 August 2010. ^ "Dr Who (How To Remake TV Theme)". youtube.com. Retrieved 11 April 2018. ^ "Vince Clarke Music • Studio". vinceclarkemusic.com. Archived from the original on 7 September 2015. Retrieved 3 August 2010. ^ "Chick Corea - My Spanish Heart (CD, Album)". Discogs. Retrieved 3 August 2010. ^ "Styx - Styx II (Vinyl, LP)". Discogs. Retrieved 3 August 2010. ^ "Captain And Tennille - Love Will Keep Us Together (Vinyl, LP, Album)". Discogs. Retrieved 3 August 2010. ^ Miller, Johnathan (2004). Stripped: The True Story of Depeche Mode. Omnibus Press. pp. 247–248. ISBN 1-84449-415-2. ^ "Sonic talk to DEVO". youtube.com. Retrieved 14 May 2012. ^ "George Duke - Guardian Of The Light (Vinyl, LP)". Discogs. Retrieved 3 August 2010. ^ "YouTube - Dave Formula's Custom Prodyssey". youtube.com. Retrieved 3 August 2010. ^ a b "Steve Hillage - Rainbow Dome Musick (CD, Album)". Discogs. Retrieved 3 August 2010. ^ Jackson, Blair (2006). Grateful Dead Gear - The Band's Instruments, Sound Systems, and Recording Sessions, From 1965 to 1995. Backbeat Books. p. 190. ISBN 0-87930-893-1. ^ a b c d Holmes, Thom (2008). Electronic and Experimental Music: Technology, Music, and Culture. Routledge. p. 247. ISBN 0-415-95782-6. ^ Rideout, Ernie (2008). Keyboard Presents the Best of the 80's. Backbeat. p. 69. ISBN 0-87930-930-X. ^ "Herbie Hancock - Thrust (CD, Album)". Discogs. Archived from the original on 16 September 2010. Retrieved 3 August 2010. ^ "Jean Michel Jarre - Equinoxe (CD, Album)". Discogs. Retrieved 3 August 2010. ^ "Elton John - Captain Fantastic And The Brown Dirt Cowboy (Vinyl, LP)". Discogs. Retrieved 3 August 2010. ^ a b "Equipment / The Kraftwerk FAQ - Kraftwerk Frequently Asked Questions". kraftwerkfaq.hu. Retrieved 11 April 2018. ^ "Ekseption - Trinity (Vinyl, LP, Album)". Discogs. Retrieved 3 August 2010. ^ "Kansas (2) - Song For America (CD, Album)". Discogs. Retrieved 3 August 2010. ^ "R.E.M. - New Adventures In Hi-Fi (CD, Album)". Discogs. Retrieved 9 April 2011. ^ "Fleetwood Mac - Heroes Are Hard To Find (Vinyl, LP, Album)". Discogs. Retrieved 3 August 2010. ^ "Gary Numan - Telekon (Vinyl, LP, Album)". Discogs. Retrieved 3 August 2010. ^ Dann, Jonathan. "Anthony Phillips FAQ". Retrieved 15 December 2012. ^ Future music, Issues 113-117. Larpress. 2001. p. 104. ^ Justin Kleinfeld (April 1, 2004). "Skinny Puppy on recording and producing The Greater Wrong of the Right". Electronic Musician Magazine. Archived from the original on 2015-04-02. Retrieved 3 August 2010. ^ "Eliane Radigue - Triptych (CD)". Discogs. Retrieved 3 August 2010. ^ "Klaus Schulze - Picture Music (Vinyl, LP, Album)". Discogs. Retrieved 3 August 2010. ^ "Caravan - For Girls Who Grow Plump In The Night (Vinyl, LP, Album)". Discogs. Archived from the original on 2 September 2010. Retrieved 3 August 2010. ^ "In pictures: Todd Terje's Oslo studio". musicradar.com. Retrieved 11 April 2018. ^ Borgli, Kristoffer (29 January 2013). "WHATEVEREST". Retrieved 11 April 2018 – via Vimeo. ^ "Won't Get Fooled Again". youtube.com. Retrieved 11 April 2018. ^ "Joe Walsh - Barnstorm (Vinyl, LP, Album)". Discogs. Retrieved 3 August 2010. ^ Vail, Mark (2000). Vintage Synthesizers: Pioneering Designers, Groundbreaking Instruments, Collecting Tips, Mutants of Technology. Miller Freeman Books. p. 125. ISBN 0-87930-603-3. ^ Baraka, Imamu (1976). "Weather Report". Down Beat Magazine. 43: 46. ^ "Zawinul Online - Keyboards". zawinulonline.org. Retrieved 26 February 2012. Wikimedia Commons has media related to ARP synthesizers. Arp continued into Virtual Instruments Arp 2600 and Arp Axxe (Kikaxxe) at wayoutware.com WOW! This page was last edited on 3 February 2019, at 00:10 (UTC).